For many years I preferred active vacations, whether it was backpacking to Machu Picchu or wandering the streets of Montmartre. To me, vacations were a chance to experience the world—not to merely melt into the sand on a beach or swing in a hammock. These days, hectic workdays and creeping age have combined to make a slacker’s vacation more attractive. I’ve traveled to Costa Rica many times and have wandered the tourist route (Monteverde’s cloud forest, Arenal's volcano and hot springs, the Nicoya Peninsula’s beaches, Manuel Antonio’s wildlife-packed national park) and explored some lesser-known spots such as Uvita, Dominical and San Gerardo de Dota. Before this February, though, there were some recommended areas, the Osa Peninsula and Corcovado National Park, that I hadn’t made it to yet. I was told that these areas—with only a few hotels and a remote location—were the most pristine and boasted the most wildlife. Bosque del Cabo, a 45-minute drive on a pockmarked, rock-strewn road from a little airstrip in the dusty town of Puerto Jimenez, is an off-the-grid rainforest lodge and reserve that bills itself as the best place in the country to spot a rare and elusive lion (or puma, as they’re called in these parts). I’ll admit: I was skeptical. Staff at other reserves I’ve visited (in every Central American country except El Salvador) advised that pumas are never sighted. 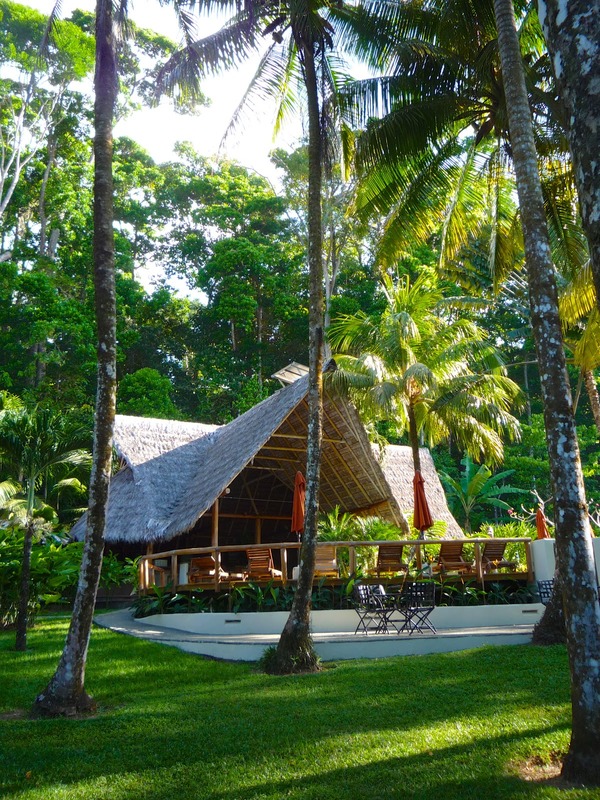 Well, after my arrival at this isolated and verdant slice of pristine rain forest, I decided that merely spending some days in the company of giant trees, adjacent to thick, emerald-green jungle and 500 feet above the Pacific would be enough. I didn’t need to see a lion. Heck, I didn’t need to see any wildlife. Upon our arrival, smiling staff greeted us with tumblers full of blackberry juice, so fresh, rejuvenating and delicious I didn’t even mind that it wasn’t sluiced with some spirit. Before being escorted to the house we rented (and stopping off to see a slumbering sloth locked onto a tree limb), we inhaled lunches full of locally sourced ingredients, including fish, crisp greens, citrus and nuts. The setting for the communal meals is an enormous palapa (an open-sided, thatch roofed structure) overlooking sweeping lawns dotted with blooming bushes and palms. I was sorry to leave such a setting, but when I arrived at the house, I was quickly smitten. Spacious rooms and an expansive terrace of polished, mahogany floors, plantation shutters, and private views overlooked a tangle of jungle that plunged to the ocean far below. That’s the problem with this place: there are so many idyllic spots that I felt as inconstant and fickle as a teenager. No matter where I was—the hammock, the terrace, a groomed trail, a hanging bridge, the pool or the restaurant—it was my favorite place. After settling in, we quickly figured out that an expensive trip to nearby Corcovado National Park was unnecessary: the private reserve right where we were boasted more wildlife and groomed trails to boot. For the ambitious, there’s a steep trail that descends to the pristine shoreline and its empty beaches. Walk to the right and you’ll enjoy miles of uninterrupted beach and rough surf (there’s no swimming here). For those who prefer a swim after their hike, a different trail descends from the hotel grounds to the wide and equally empty swimming beaches along the calm Golfo Dulce. But a person doesn’t travel to Bosque for the beaches. It’s the wildlife and rain forest that attract a small but steady flow of tourists to the two-dozen bungalows and houses. Mornings start before first light with the calls of howler monkeys. (Yes, this would be sometime around 4:00 am.) Second-string parrots and myriad songbirds join in around 5:00 or so. And just after dawn, late-to-rise but instantly garrulous macaws spin overhead and fill the air with their primeval call. I’ve seen scarlet macaws in other spots in Costa Rica, but never have I seen so many so often. Thankfully, the open-air restaurant has plenty of steaming, dark, local coffee available, so even if the call of monkeys, locusts or birds drives you from your mosquito net-cocooned bed early, there’s an eye-opening cup of fragrant java to help you appreciate your surroundings. If walking the private trails, observing abundant wildlife, lolling by the pool or gazing out over the cobalt Pacific starts to bore, trips to nearby beaches, snorkeling, kayaking and other short excursions are available. To me, though, leaving any spot in this place is difficult. When my friends and I returned to the tranquil grounds of the hotel—rich with birdsong and dappled with blooming flowers—I felt like I was home. As much as I enjoyed the communal dinners and hikes, it’s the terraces, decks and bungalow spaces with their private slices of jungle and views that thrill. In such a place, the reality that days in the Tropics don’t last longer saddened me. From late afternoon through sunset my friends and I were sprinkled across the terrace, tucked into hammocks or reclined on lounge chairs. We read, sipped wine, puzzled over crosswords or simply gazed out over the Pacific, into the thick jungle or at the infinite sky. As sunset approached, everyone’s attention shifted to the horizon and the spectacle of a colorful blaze illuminating the horizon while the world around us gradually fell silent. The jungle—a cacophony of locust buzzes, birdcalls and monkey howls—lapsed into deep stillness as the light faded from the sky. The sky turned black and was thronged with stars while the ocean crashed below. Sure, there could have been pumas about, but I could’ve cared less. They’d like you to think that it’s the pumas that make Bosque del Cabo unique, but that’s not it at all. Awaking to the sounds of monkeys, the crash of the ocean, the call of a macaw or the scent of the rain forest, I realized that there’s much more to this place than some rare felines. But you need to experience it to understand. Bosque del Cabo can be reached via small plane commercial service (about a 45 minute flight) from San José to Puerto Jimenez. The lodge can also be reached via rough roads. A few categories of private bungalows and houses can be rented, most with ocean views. Prices per person range from around $150 per day (including meals) to around $250, depending on accommodation type and season. The excellent restaurant is the best option for guests. Meal packages are typically included as part of the rate, though guests staying in houses can opt out. Preoccupied with the future, we Chicagoans don’t spend much time fawning over our past. After all, what other city would raze architectural gems by American icons such as LouisSullivan and Daniel Burnham? Yes, we’ve torn down probably half of our architectural legacy, but we’ve made some notable exceptions. One of my favorites is Burnham and Root’s Monadnock Building, a hulking, solid masterpiece that recalls an era when the height of structures was restricted by the weight its loadbearing walls could handle. The building is associated with many firsts, but what I like best are its look and feel—outside and inside—and the handful of independent, local shops that line its dimly lit lobby. In addition to having brick walls as thick as those of a medieval castle, the Monadnock offers a rare glimpse of an office building circa 1893—the year of its construction. 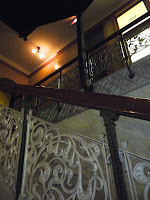 Mosaic tile floors, iron staircases and gleaming woodwork mark the interior, making it unique and rich with atmosphere. 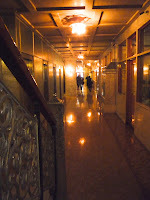 Stepping into the shadowy hallways of the building is like stepping back in time. Retro light fixtures flicker, offering yellowy, other-worldly light by which you can view generous amounts of marble décor, mosaic tile floors, and dramatic stairways that rise into warrens of offices inhabited by small businesses, attorneys, not-for-profits and accountants. 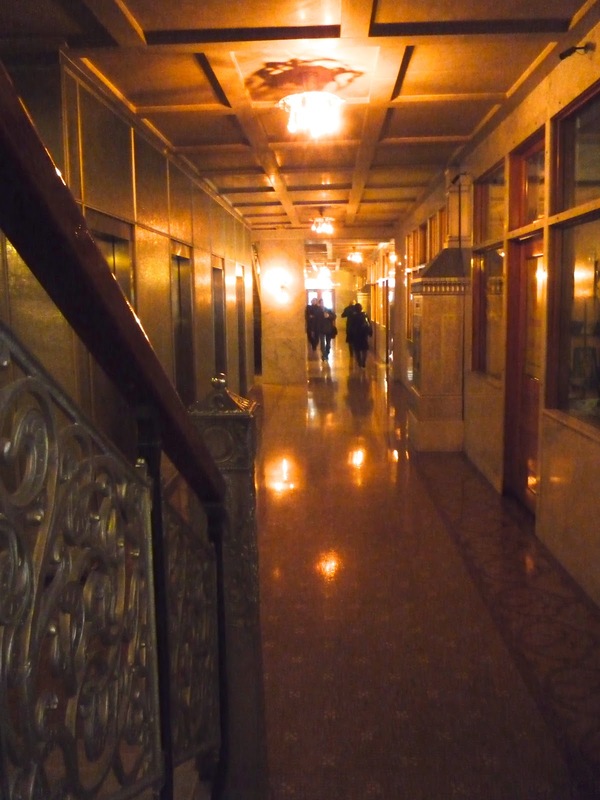 The building’s dimly and naturally lit passages are movie set perfect. The main floor stores offer a variety of Old School products and services, including bespoke, locally-made hats at Optimo, cigars, flowers, shoe shine and repair, custom men’s suits, women’s clothier Floradora, a restaurant and a suitably dark bar with a popcorn machine. There are no chains here, unless you count Intelligentsia, a refined local coffee outfit that churns out award winning coffees and world champion baristas. When German Chancellor Helmut Kohl visited the city a few decades ago, he was shown all of our famous architectural towers—the Wrigley, Tribune, Hancock, Sears and Marina City. But it was the Monadnock that impressed him the most. To him—and to me—the Monadnock is everything an earlier Chicago skyscraper should be: brawny, understated, modern, and well-designed. And the fact that within its thick brick walls you can purchase a hand-crafted hat, sip a tasty cup of coffee and have your shoes shined while reading the newspaper, makes it truly unique and quintessentially Chicago.